Three CCGA productions have been rewarded with recognitions at the 2009 International Marcom Award Competition and the 2009 International AVA Award Competition. The CCGA SAR Management System (SMS) Training Video was presented with a Marcom Platinum Award plus an Ava Platinum Award in the Training Video category. The Bobbie Noble Video was presented with a Marcom Gold Award in the Inspirational Video category. Finally, the French video Kayakistes en difficulté won an Ava Gold Award for Film - Foreign Language. The MarCom Award is an international competition for marketing and communication professionals involved in the concept, writing and design of marketing and communication programs and print, visual and audio materials. The international Ava Awards recognizes outstanding work by creative professionals involved in the concept, writing, direction, shooting, and editing of audio-visual materials and programs. 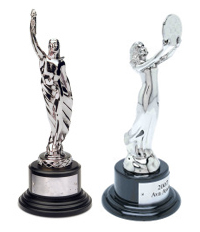 Both MarCom and Ava Awards are administered and judged by the Association of Marketing and Communication Professionals.